Plot Summary / Role Description: : Harry Burck is an engineer working temporarily in Colombia to build a plant. The day before he's supposed to go back, the American ambassador comes to visit. The minions of a drug lord attack and take both men. The drug lord wants to trade their lives for those of their drug dealer friends in jail, but the government doesn't negotiate with terrorists. Harry's brother Corey is left to his own devices. His plan is to hire a mercenary to go down to Colombia and rescue Harry. He gives a spirited talk to Harry's three best friends and manages to talk them into going with him. These friends are Pachowski, Kurt, and Spence. Spence is a working-class guy who thinks he knows everything. He's the cynic and the pessimist, always thinking of what could go wrong. He also has a fondness for blow which he says "keeps him alert." However, he is shrewd. He's the one who is able to talk millionaire car dealership owner Jack into putting up the money for the trip. Hungry for excitement, Jack also accompanies them. 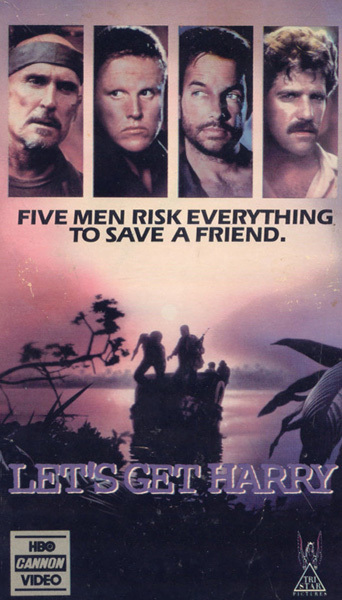 Four working-class guys, a car dealership owner, and a mercenary named Norman Shrike - doesn't sound too promising for a rescue mission. But they hop on a plane to go down to Colombia anyway. Things start out badly when as soon as they land, they get chased down by some military police who shoot out their tires. They finally get to a hotel in a small Colombian town. Shrike tells everyone, "listen to me or you'll get yourselves killed." The guys have to learn this the hard way, though. Corey and Pachowski follow him from the hotel, only to get attacked by thugs - forcing Shrike to come back and rescue them. Then, when they try to buy some weapons, they get set up and thrown into a Colombian jail. Poor Shrike is tortured within an inch of his life by the Colombian police because they believe he's been sent by someone else. Obviously, all he can tell them is "no one sent me," so they give up on him and start on Corey. When Corey says the same thing, they realize he's telling the truth. They take them all to a hanger where an American ambassador named Clayton tells them that Harry will be home soon and they all need to go home with him on the plane. It's all BS, though, and Shrike is wise to it. As the plane taxis down the runway, Shrike holds a knife to Clayton while all the rest of the guys jump out except Kurt, who wants to go home. Shrike, Corey, Pachowski, Jack and Spence go back to the arms dealer and this time, they get their weapons and get ready to go. Shrike gives them some last minute training and they get to work. However, once again they are sent into an ambush. The guys make their first kills.... but they lose Shrike. Panic and depression hit. Corey looks weepily at photos of Shrike's while Spence plays blues on the harmonica. They take the girl who lives at the house prisoner and she's questioned by Jack. For a car salesman, Jack's a pretty scary interrogator. He starts to torture the girl by burning her with a cigar when she won't answer his questions, and Corey comes to the rescue. He apologizes and lets her go. She rewards them by becoming their ally and helping them find Harry. She knows where the compound is and takes them there, as well as showing them where in the compound Harry is most likely located. The guys form a plan. They're going to go into the compound and split up. Spence and Pachowski are going to blow up a couple buildings as a distraction while Jack and Corey move in to get Harry. Jack and Corey start towards where Harry and the ambassador are being held. Meanwhile, Spence wiggles underneath the floorboards of a building to rig it to blow and takes out the guy inside with a knife. Once inside, Spence sees the piles of cocaine that he's about to blow away and gets a little misty-eyed, but he doesn't let it interfere with the plan. Then, Corey is discovered, shooting starts, and all hell breaks loose. Spence and Pachowski do a good job of taking out guards, but then the drug lord holds a gun to Harry and threatens to kill him unless they all stop. Jack steps forward angrily and gets shot, but as he goes down he takes out everybody else around them except the drug lord. Corey gets in a tussle with the drug lord and kills him. Harry is rescued. Pachowski's behind them, covering them, and when he tries to catch up he's shot in the leg. Under cover of a tree, he's able to take out the guys coming after him until he runs out of bullets. Just as things look hopeless, the rest of the gang runs up and rescues him. They all jump in the motorboat and sail away, top speed, blowing up the dock behind them. They all return home to great celebration, and everyone hugs Kurt to let him know he's forgiven for leaving early. The End.